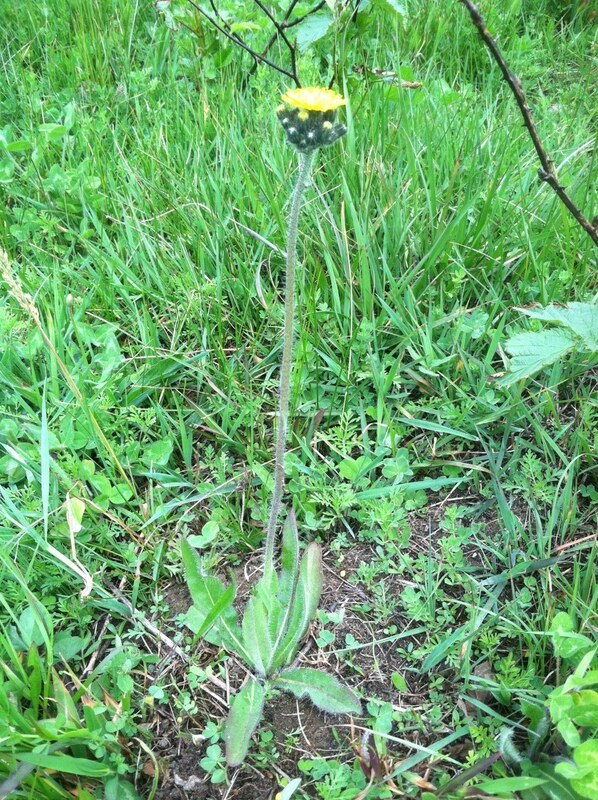 King devil, Hieracium pratense, or H. caespitosum is sometimes called field hawkweed. it is in the composite family. It is a weed and considered invasive by many managers, including yours truly. Do not confuse this plant with native H. longipilum which blooms a few weeks after king devil. The map shows a lot of occurrences of this weed on the main unit of Nachusa Grasslands preserve, but we have reduced this weed to a sprinkling of plants here and there. We find we can patrol for this weed and others like sweet clover and birdsfoot trefoil at the same time, so the effort for this king devil control does not feel onerous. For all weeds start off with an experimental attitude. One early task is to mark a map with all the occurrences you find. This helps you see if you have a realistic chance of success. To figure out what methods work search the web and talk to colleagues, and try some different techniques. We find Element 3A or Crossbow works well on king devil. We spray all the basal leaves of the flowering and the nearby non-flowering plants with a backpack or squirt bottle. We then pluck off the flowers as we have noticed the sprayed plants seem to produce a viable looking seed as they die. We put the flowers heads in a bag or disposable glove we tend to carry in our pockets, and then pitch that bag into the kitchen garbage bag. It feels good to do this. You might try a few different herbicides as an experiment, or perhaps you can dig them up. Try clearing one area and see how it goes. We sometimes mark weed occurrences with 1″ by 2″ wood stakes. We have used pvc pipe as shown but it curls over in fires. We often GPS occurrences using smart phone apps like MotionX GPS. We like to make three visits to all weed outbreaks per year to get great results. Two visits per year makes progress. One visit per year breaks even. A visit every few years is likely worthless. Be a happy weed warrior. Weed work is fun, not a burden. Keep saying this to yourself. 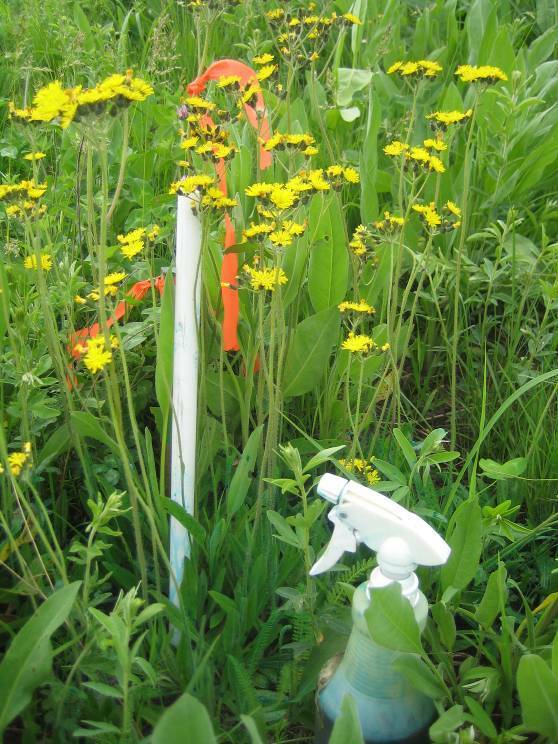 This entry was posted in Uncategorized and tagged Hieracium, Invasive species, king devil, Weed, Weed control. Bookmark the permalink. 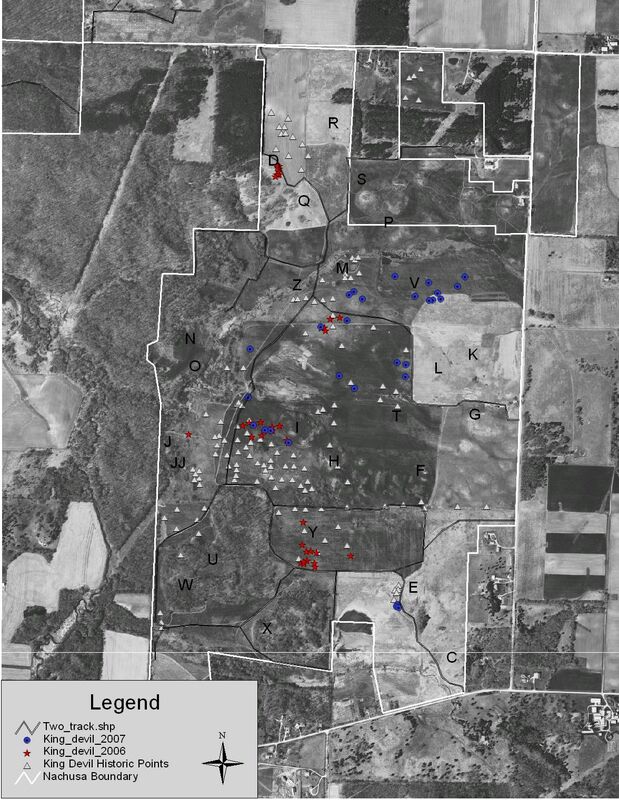 When I started at Somme and many other sites in northeastern Illinois, our degraded remnants had vast amounts of this hawkweed along with other alien species including orchard grass, smooth brome, Kentucky bluegrass (European), ox-eye daisy, and wild carrot. They’ve steadily decreased in abundance over the years with regular burning and inter-seeding with diverse natives, especially conservatives. It may do more harm than good to control these, especially with herbicide. Or it may do more good than harm. In my experience such species are not what we call “invasive.” They don’t kill of the diverse, quality species as do reed canary grass, birds-foot trefoil, teasel, crown vetch, and purple loosestrife (at least on our soils). Instead they are gradually killed off by the diverse quality species – in the meantime perhaps contributing to low stature and more niches – which may encourage the establishment of diverse conservatives. Something worth someone doing some experiments on at some point?